Available in red, green, orange or hi-vis yellow. 4” Angle Cutoff Tool (part numbers PTC490, PTC490G, PTC490O & PTC490HV). 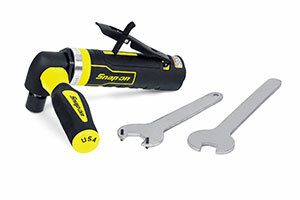 For more information on the new pneumatic grinders and cutoff tools from Snap-on Industrial, call (877) 740-1900, or visit www.snapon.com/industrial.